Alciato at Glasgow: Emblem: In temerarios. Contre temeraires. Ignivomos ausum flectere Solis equos. Maxima qui postquàm terris incendia sparsit. Est temere insesso lapsus ab axe miser. You see here Phaethon, driving his father’s chariot, and daring to guide the fire-breathing steeds of the Sun. After spreading great conflagrations over the earth, the wretched boy fell from the car he had so rashly mounted. - Even so, the majority of kings are borne up to heaven on the wheels of Fortune, driven by youth’s ambition. After they have brought great disaster on the human race and themselves, they finally pay the penalty for all their crimes. Lont pugny de ce quil esleut. Il chet soubz le mal qui le presse. 1. Phaethon, the son of Apollo, the sun-god. The myth referred to here is told in Ovid, Metamorphoses 1.748 - 2.349. Both Phaethon and Icarus ([A39a053]) are types of those who aim too high and do not recognise their proper sphere. Emblematum liber (28th February, 1531), Augsburg: IN TEMERARIOS. Emblematum liber (6th April, 1531), Augsburg: IN TEMERARIOS. Emblematum liber (1534), Augsburg: IN TEMERARIOS. Emblematum libellus (1534), Paris: In Temerarios. Livret des emblemes (1536), Paris: In Temerarios. Contre temeraires. 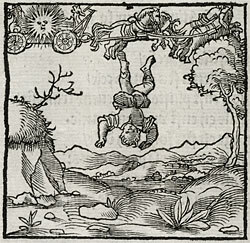 Les Emblemes (1542), Paris: In temerarios. Contre temeraires. Emblematum libellus (1542), Paris: In temerarios. Wider die freuenlichen. Los Emblemas (1549), Lyon: Contra los vanos principes. Emblemes (1549), Lyons: Contre les temeraires. Emblemata (1550), Lyon: In temerarios. Emblemata (1551), Lyon: In temerarios. Diverse imprese (1551), Lyon: Furore, e rabbia. Emblematum libri II (Stockhamer) (1556), Lyon: In temerarios. Toutes les emblemes (1558), Lyon: Contre les temeraires. Liber emblematum ... Kunstbuch (1567), Franckfurt am Main: In temerarios. Wider die verwegnen. Emblemata / Les emblemes (1584), Paris: In temerarios. Contre les temeraires. Emblemata (1591), Leiden: Furor & rabies. Declaracion magistral sobre las Emblemas de Andres Alciato (1615), Najera: IN TEMERARIOS. Les emblemes (1615), Geneva/Cologny: Contre temeraires. Emblemata (1621), Padua: In temerarios.